Energy "flows" through the ecosystem in the form of carbon-carbon bonds. When respiration occurs, the carbon-carbon bonds are broken and the carbon is combined with oxygen to form carbon dioxide. This process releases the energy, which is either used by the organism (to move its muscles, digest food, excrete wastes, think, etc.) or the energy may be lost as heat. The dark arrows represent the movement of this energy. Note that all energy comes from the sun, and that the ultimate fate of all energy in ecosystems is to be lost as heat. Energy does not recycle!! In this unit we will seek to quantify the relative importance of different component species and feeding relationships. This unit is a minimum of 6 hours. Ecosystems are linked together by energy and matter flows. The Sun's energy drives these flows, and humans are impacting the flows of energy and matter both locally and globally. Why are maximum sustainable yields equivalent to the net primary or net secondary productivity of a system? Why would harvesting biomass at a rate greater than NPP or GPP be unsustainable? How can systems diagrams of carbon and nitrogen cycles be used to who the effect of human activities on ecosystems? What are the strengths and weaknesses of such diagrams? Solar energy is any type of energy generated by the sun. ​About 30% of the solar energy that reaches Earth is reflected back into space. The rest is absorbed into Earth’s atmosphere. Just as the incoming and outgoing energy at the Earth’s surface must balance, the flow of energy into the atmosphere must be balanced by an equal flow of energy out of the atmosphere and back to space. The radiation warms the Earth’s surface, and the surface radiates some of the energy back out in the form of infrared waves. As they rise through the atmosphere, they are intercepted by greenhouse gases, such as water vapor and carbon dioxide. 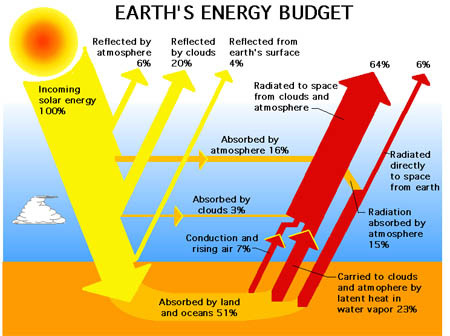 Greenhouse gases trap the heat that reflects back up into the atmosphere. In this way, they act like the glass walls of a greenhouse. This greenhouse effect keeps the Earth warm enough to sustain life. Almost all energy that drives processes on Earth comes from the sun. This is called solar radiation and is made up of visible wavelengths (light) and those wavelengths that humans cannot see (UV and infrared). Some 60% of this is intercepted by atmospheric gases and dust particles. Nearly all UV light is absorbed by ozone. Both ultraviolet and visible light energy (short wave) are converted to heat energy (long wave), following the laws of thermodynamics. The systems of the biosphere are dependent on the amount of energy reaching the ground, not the amount of energy reaching the outer atmosphere. This amount varies according to the time of day, the season, the amount of cloud cover and other factors. Most of this energy is not used to power living systems, it is reflected from soil, water or vegetation or absorbed and re-radiated as heat. Of the energy reaching the Earth's surface, about 35% is reflected back into space by ice, snow, water and land. Some energy is absorbed and heats up the land and seas. Of ALL the energy coming in, only about 1-4% of it is available to plants on the surface of the Earth. 2.3.U3 Pathways of energy through an ecosystem include: conversion of light energy to chemical energy, transfer of chemical energy from one trophic level to another with varying efficiencies, overall conversion of ultraviolet and visible light to heat energy by an ecosystem, re-radiation of heat energy to the atmosphere. The distinction between storages of energy illustrated by boxes in energy-flow diagrams (representing the various trophic levels), and the flows of energy or productivity often shown as arrows (sometimes of varying widths) needs to be emphasized. The former are measured as the amount of energy or biomass per unit area and the latter are given as rates, for example, J m–2 day–1. This energy is captured by green plants which convert light to chemical energy (glucose). The chemical energy (glucose) is then transferred from one trophic level to the next. The amount of organic matter or biomass produced by an individual organism, population, community or ecosystem during a given period of time is called productivity. Primary production refers to all or any part of the energy fixed by plants possessing chlorophyll. The total amount of solar energy converted (fixed) into chemical energy by green plants (by the process of photosynthesis) is called 'Gross Primary Production' (GPP). A certain portion of gross primary production is utilized by plants for maintenance (respiration energy loss) and the remainder is called 'Net Primary Production (NPP)' which appears as new plant biomass. It is more useful to measure Net Primary Production (NPP). The remainder of glucose produced from photosynthesis is deposited in and around cells representing the stored dry mass. The accumulation of dry mass is usually termed biomass. Biomass provides a useful measure of the production and use of resources. Use the equation NPP = GPP – R; where R = respiratory loss. Primary production is the foundation of all metabolic processes in an ecosystem, and the distribution of production has a key part in determining the structure of an ecosystem. Production also occurs in animals as Secondary Production. Importantly though animals do not use all the biomass they consume. Unlike the primary productivity net productivity, secondary involved feeding or absorption. Secondary production is the generation of biomass of the consumer in a system. This is driven by the transfer of organic material between trophic levels, and represents the quantity of new tissue created through the use of assimilated food. Secondary production is sometimes defined to only include consumption of primary producers by herbivorous consumers,but is more commonly defined to include all biomass generation by heterotrophs. This is the reason only. 2.3.U7 Net secondary productivity (NSP) is calculated by subtracting respiratory losses (R) from GSP. Secondary production is the generation of biomass of heterotrophic (consumer) organisms in a system. This is driven by the transfer of organic material between trophic levels, and represents the quantity of new tissue created through the use of assimilated food. Production which occurs in animals is known as secondary production. The net quantity of energy transferred and stored in the somatic and reproductive tissues of heterotrophs over a period of time is called secondary productivity. Gross secondary production in animals equals the amount of biomass assimilated or biomass eaten less feces. As in the case of plants herbivores and carnivores ingest the food material out of which a part gets assimilated and a part is egested. A large part of the assimilated energy is consumed during metabolic process like respiration, growth, reproduction etc and the rest is available to be laid down as new biomass. The Net Secondary Production (NSP) = Energy assimilated from the food eaten - faeces – energy consumed for respiration. Secondary productivity indicates about food resources available to the heterotrophic populations, including man, in the food chain. 2.3.U8 Maximum sustainable yields are equivalent to the net primary or net secondary productivity of a system. Maximum sustainable yield is e—Equivalent to the NSP or NPP of system. This information can be and important number for farmers who are trying to predict how much money they will get for their product. Farmers are often paid by how much biomass (often measured by weight/acre) that their crop yields. Modern agricultural economists spend many months predicting yields which drives prices of the food you buy. Along with energy, water and several other chemical elements cycle through ecosystems and influence the rates at which organisms grow and reproduce. About 10 major nutrients and six trace nutrients are essential to all animals and plants, while others play important roles for selected species (footnote 3). The most important biogeochemical cycles affecting ecosystem health are the water, carbon, nitrogen, and phosphorus cycles. The carbon cycle involves the processes of photosynthesis and respiration. Carbon dioxide plays an important role in photosynthesis. Plants use energy from light to split water molecules; they then use carbon dioxide to synthesize carbohydrates. One of the products of this reaction is oxygen. Photosynthesis is the major source of oxygen in Earth’s atmosphere. For some 1.5 billion years before green plants were on Earth, algae and bacteria provided the photosynthesis needed to build Earth’s oxygen levels to the point that respiration of both plants and animals could occur. Nitrogen is an element that is often a limiting factor for plant growth. Although atmospheric nitrogen is abundant, it is not in a form that plants can readily access. The nitrogen molecule found in the atmosphere must be split and recombined with atoms to form molecules that are soluble in water. This is called nitrogen fixation. Typically nitrogen is fixed in the form of ammonium or nitrate ions. Some of this fixing occurs in the atmosphere due to lightning. Most nitrogen is fixed by bacteria. When plants and other organisms die, through leaching and the activities of other bacteria the nitrogen is returned to the atmosphere ready to begin the cycle again. 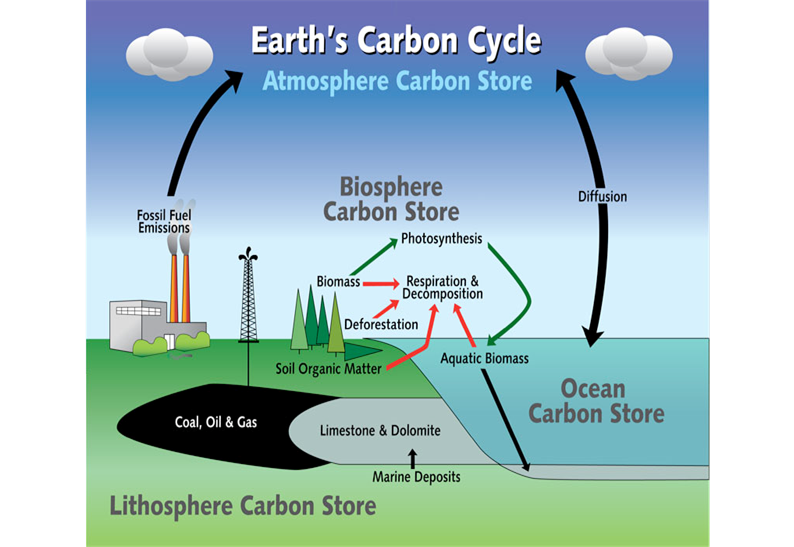 Carbon is stored in organisms and forests, the atmosphere, soil, fossil fuels, and in the oceans. —Places where carbon is stored are called Carbon Sinks —The oceans are the largest carbon sinks, holding many times more carbon than all the forests on earth combined. —Climate change is affecting how much carbon the ocean can hold. The carbon cycle is one of the major biogeochemical cycles describing the flow of essential elements from the environment to living organisms and back to the environment again. This process is required for the building of all organic compounds and involves the participation of many of the earth's key forces. The carbon cycle has affected the earth throughout its history; it has contributed to major climatic changes, and it has helped facilitate the evolution of life. carbon dioxide from the atmosphere dissolving in rainwater. 2.3.U12 Storages in the nitrogen cycle include organisms (organic), soil, fossil fuels, atmosphere and water bodies (all inorganic). Nitrogen is stored in organisms, soil, fossil fuels, atmosphere, and bodies of water. Places where nitrogen is stored are called Nitrogen Sinks. The nitrogen cycle, similarly to the other biochemical cycles, cycles nitrogen from storage pools into directly usable forms and back again. The atmosphere acts as vast storage reservoir for nitrogen because it is 78 percent nitrogen. Because of this, the atmosphere is the largest storage reservoir of nitrogen. Nitrogen is also stored in: watershed in soil, groundwater, ocean water, sediment and plant matter (dead and living). Human activities are increasing nitrogen's storage in groundwater. It has been seen that groundwater in developed countries stores significantly more carbon than that of developing countries. In nature groundwater is a fairly small and insignificant storage reservoir. Nitrogen is contained in both inorganic and organic molecules/reservoirs. Organic reservoirs that contain nitrogen include: amino acids, peptides, nucleic acids and proteins. Each of these molecules is vital to an organisms survival which emphasizes the importance of the nitrogen cycle. Examples of inorganic molecules that contain nitrogen include man-made fertilizers and ammonia. These molecules are less important to both the survival of organisms and the nitrogen cycle itself. 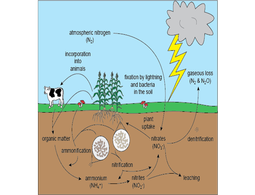 2.3.U13 Flows in the nitrogen cycle include nitrogen fixation by bacteria and lightning, absorption, assimilation, consumption (feeding), excretion, death and decomposition, and denitrification by bacteria in water-logged soils. 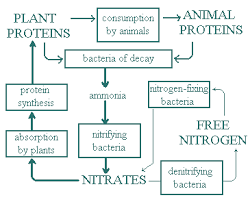 The nitrogen cycle represents one of the most important nutrient cycles found in terrestrial ecosystems. Nitrogen is used by living organisms to produce a number of complex organic molecules like amino acids, proteins, and nucleic acids. Storages, yields and outputs should be included in the form of clearly constructed diagrammatic and graphical models. 2.3.A2 Analyse the efficiency of energy transfers through a system. Large amounts of energy are lost from the ecosystem between one trophic level and the next level as energy flows from the primary producers through the various trophic levels of consumers and decomposers. The main reason for this loss is the second law of thermodynamics, which states that whenever energy is converted from one form to another, there is a tendency toward disorder (entropy) in the system. ​​2.3.A3 Discuss human impacts on energy flows, and on the carbon and nitrogen cycles. ​Humans clearly disrupt many, if not all biogeochemical cycles and in the process threaten many ecosystems. In resent years human activities have directly or indirectly affected the biogeochemical cycles that determine climatic conditions of earth. It is imperative to mention that, managing and understanding environmental problems caused by climate change would require an understanding of the biogeochemical cycles. Biogeochemical cycles always involve equilibrium states: a balance in the cycling of the element between spheres. However, overall balance may involve elements distributed on a global scale and that is why a disruption in one cycle causes a disruption in all other cycles. Below is a summary of how human activities have contributed to disruption of biogeochemical cycles. For impacts on specific cycles, the reader should refer to the sites where these cycles are presented. Phosphorus fertilizers: Human influences on the phosphorus cycle come mainly from the introduction and use of commercial synthetic fertilizers. Use of fertilizers mainly has affected the phosphorus and nitrogen cycles. Plants may not be able to utilize all of the phosphate fertilizer applied; as a consequence, much of it is lost from the land through the water run-off. The phosphate in the water is eventually precipitated as sediments at the bottom of the water body. In certain lakes and ponds this may be redissolved and recycled as a problem nutrient. Animal wastes or manure may also be applied to land as fertilizer. If misapplied on frozen ground during the winter, much of the fertilizer may be lost when ice melts and forms runoff. In certain areas very large feed lots of animals, may result in excessive run-off of phosphate and nitrate into streams. Other human sources of phosphate are in the out flows from municipal sewage treatment plants. Without an expensive tertiary treatment, the phosphate in sewage is not removed during various treatment operations. Again an extra amount of phosphate enters the water. Mining of Fossil fuels: Humans have interfered with the carbon cycle where fossil fuels have been mined from the earth crust. Had fossils not been discovered prior to industrial revolution, they could have remained there until now. Carbon dioxide is number one green house gas contributing to global warming and climate change. Additionally, clearing of vegetation that serve as carbon sinks has increased the concentration of carbon dioxide in the atmosphere. Production of Sulphur dioxide: Human impact on the sulfur cycle is primarily in the production of sulfur dioxide (SO2) from industry (e.g. burning coal) and the internal combustion engine. Sulfur dioxide can precipitate onto surfaces where it can be oxidized to sulphate in the soil (it is also toxic to some plants), reduced to sulphide in the atmosphere, or oxidized to sulphate in the atmosphere as sulphuric acid (a principal component of acid rain). Sulphur compounds play a big role in the climate system because they are important for the formation of clouds. Additionally, a lot of sulphur is brought into the air by volcanic eruptions. A strong eruption can emit particles up to the stratosphere hence leading to cooling down of the planet. The application of nitrogen fertilizers to crops has caused increased rates of denitrification and leaching of nitrate into groundwater. The additional nitrogen entering the groundwater system eventually flows into streams, rivers, lakes, and estuaries. In these systems, the added nitrogen can lead to eutrophication. Increased deposition of nitrogen from atmospheric sources because of fossil fuel combustion and forest burning. Both of these processes release a variety of solid forms of nitrogen through combustion. Livestock ranching. Livestock release a large amounts of ammonia into the environment from their wastes. This nitrogen enters the soil system and then the hydrologic system through leaching, groundwater flow, and runoff. Sewage waste and septic tank leaching. ​2.3.S1 Construct a quantitative model of the flows of energy or matter for given data. 2.3.S2 Calculate the values of both GPP and NPP from given data. ​2.3.S3 Calculate the values of both GSP and NSP from given data. ​Gross secondary productivity(GSP): is gained through absorption in consumers. This activity, prepared by Newport High School, will help you improve your ability to calculate productivity from data. ​The Sun’s energy drives energy flows, and throughout history there have been “myths” about the importance of the Sun—what role can mythology and anecdotes play in the passing on of scientific knowledge? In this NASA eClips video segment learn how NASA uses CERES, a satellite in our Earth observing system, to make accurate measurements of energy leaving the Earth. Discover how NASA studies the interactions of clouds with sunlight and heat to determine how much heat is emitted back into space. Demonstrations are used to help support the segment. Looks at the processes that are fundamental to all ecosystems. First the concepts of primary productivity, trophic levels, food chains, energy pyramids and the flow of energy through ecosystems are introduced. The program then explains how carbon, nitrogen, phosphorous and water cycle through ecosystems and how human activities can disrupt these cycles and throw them out of balance leading to accelerated eutrophication in lakes in the case of phosphorous imbalances and global warming in the case of carbon imbalances. In this video Paul Andersen explains how energy flows in ecosystems. 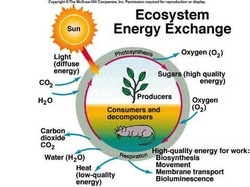 Energy enters via producers through photosynthesis or chemosynthesis. 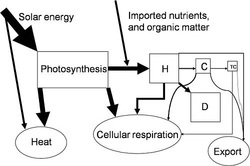 Producers and consumers release the energy from food through cellular respiration. An explanation of gross primary productivity and net primary productivity are included. Energy and biomass in ecological pyramids show energy efficiency. Hank introduces us to biogeochemical cycles by describing his two favorites: carbon and water. The hydrologic cycle describes how water moves on, above, and below the surface of the Earth, driven by energy supplied by the sun and wind. The carbon cycle does the same... for carbon! What exactly is the carbon cycle? Nathaniel Manning provides a basic look into the cyclical relationship of carbon, humans and the environment. This video shows the gross primary productivity of the world's land areas for the period 2000-2009 as calculated from Terra's MODIS instrument. The original 8-day average GPP data has been smoothed to a 24-day average to make the animation less noisy. This version adds a date and colorbar to the animation. 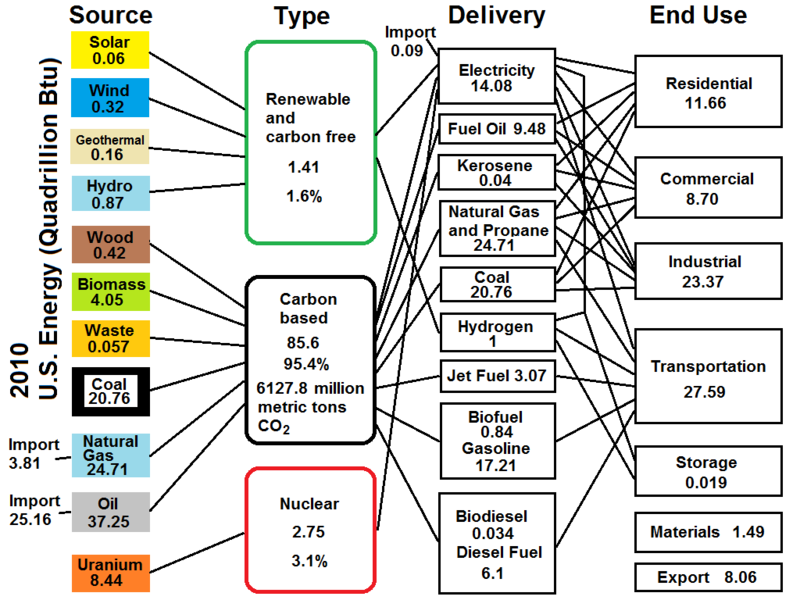 NPP is basically how much carbon is stored in the biosphere. It has been found that not all carbon from burning fossil fuel carbon goes into the air, and that the ocean can only take half of the remainder.